Approx. 39.5" x 6" x 2.5" Handcarved & Painted Wood Tiki Mask. We Specialize in High Quality, Unique Designs. Mask is slightly curved-Great for wall décor, patio, pool, tiki bar, & party or event decorations. 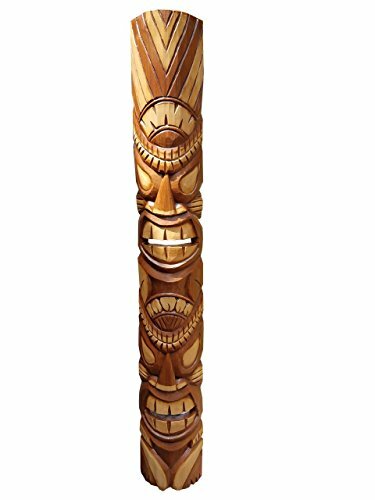 Perfect for indoor or outdoor home wall decor decoration for hawaiian luau tiki bar, tiki hut or thatching ornaments. These Tiki Masks make great gifts for any age! Size: Approx. 39.5" x 6" x 2.5" Slightly Curved Design. View More In Decorative Masks. If you have any questions about this product by All Seas Imports, contact us by completing and submitting the form below. If you are looking for a specif part number, please include it with your message. 20" Handcarved Wood Natural Tiki God Tropical Hawaiian Design Tiki Mask!